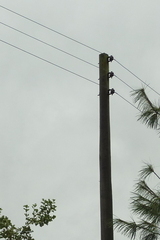 This example models the situation where an E-field receiver is operating near to a 50Hz overhead power line, as in the adjacent photo. The top wire carries 240V, the middle wire is neutral and the lower wire is earth. The model sets up a moveable E-field probe consisting of a single sphere at 3m height above ground. This height is chosen because it is close to the effective height of the actual E-field receiver. A simple shell script is easily employed to repeatedly run lcng and ngspice with a range of probe distances up to 150m. The results are plotted in the graph below. This example models a real receiver case. The antenna has an effective height of about 3m and is located 65m from the power line. The 50Hz signal at the antenna terminal is around 140mV RMS. Some of this is coming from more distant power lines.